An exclusive boutique suite hotel with stoning view to the volcano and the blue waters of the Aegean Sea, built on the Caldera cliff which is well known all over the world. The hotel was originally a mansion built in 1764 and owned by an aristocratic family, renovated in 2004.These Luxury Suites combine natural beauty, luxurious traditional living for those seeking a relaxing holiday. The elegant 4 star Roses Hotel, awaits you only 50 meters from the endless black sandy beach of Kamari. High on the edge of the Caldera in the famous village of Oia Santorini, lies Arsenia Rooms & Suites. Situated in a privileged location, 200 meters above sea level and merely a five-minutes “white washed” stroll from the center of Oia. Acknowledged as one of the most up market cliff settlements it embraces the magical aura of the Caldera. A luxurious complex, recreated of an old theran villa, situated on the top of the ridge cliff along the traditional Caldera path between Fira and Firostefani, facing the spectacular Gulf of Caldera. The panoramic view of the Aegean, the serene and luxurious environment as well as the small distance from the main town is why Angel's is so unique. Golden Beach Hotel led the way of upscale hotel services in Santorini giving us 35 years of experience in serving your needs. A thorough renovation in 2007 gave a fresh look to the harmonic blend of Aegean style with 70’s linear design forms placed right on the matchless volcanic black sand beach of Kamari for endless hours of leisure by the sea. Kastri is a hotel and restaurant that is established and run by the same family since 1985. It is located in the most picturesque of all Santorini villages, Oia (pronounced: i-a) and offers a fantastic opportunity to enjoy the beauty that Santorini is. The world's nature was much more than generous towards this niche of the Cyclades, Oia and gifted it with unique beauty. During the last centuries and under unprecedented circumstances the native people of Santorini built wondrous structures in perfect harmony with nature leading to the creation of the renowned Santorinian architecture. Feel true comfort and relaxation in the leisure setting of upscale Oia Santorini accommodation in Anemomilos Hotel Rooms, Apartments & Private Villas!At the relaxing ambiance of Anemomilos Hotel in Santorini you will be glad to select among a good variety of types accommodation in Oia, making the hotel ideal for families, couples or groups of friends of all ages. Staying in our traditional building, you would be able to enjoy a Santorini's traditional hospitality. We are located at the highest spot of Fira, and only 500m from the center of the village. Santorini Palati Hotel is situated at a distance of 7 km from the airport of Santorini and 12 km from the Athinios port. 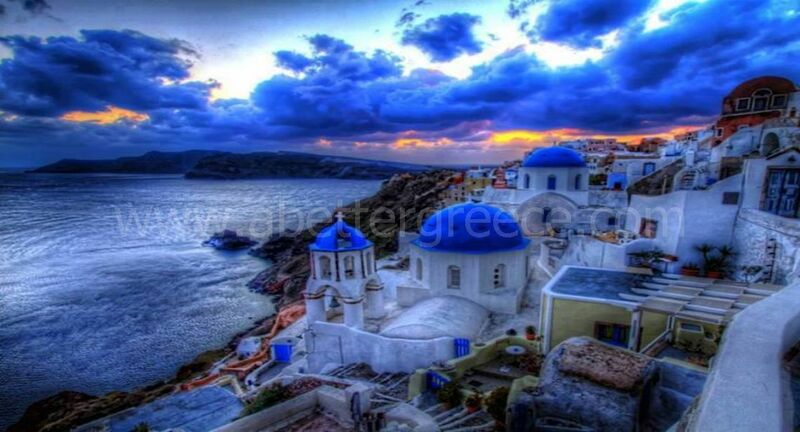 (local port which receives local ferries from the mainland, Crete and Thessaloniki).Magical Santorini with its backdrop of the Caldera and neighbouring islands, famous sunsets and historical excavations have captured the hearts of many holiday makers. The affordable Red apartments are the best choice to spend a relaxing vacation on Santorini Island. If you are looking for a romantic getaway or for family holidays here is the right place to stay. Located in the southwestern part of Santorini, near Akrotiri's prehistoric ancient ruins, and the famous Red beach. Oia sunrise studios and apartments are located on top of a cliff overlooking the village of Oia and the breathtaking Caldera. Just 10 km from Fira and 800 meters from the center of the village of Oia.The nearest beach is 2 kilometers away & can be accessed by car or bus.We can offer 9 Traditional houses, 13 Apartments and 7 Studios. The bedrooms have one double or two single beds.